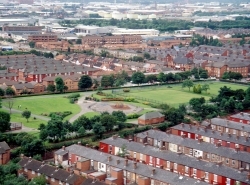 Langworthy Park is a small but popular park built on the site of a former reservoir. Located at the crossroads of Langworthy Road and Liverpool Street, the park is perhaps better known locally as Chimney Pot Park due to its raised position, which provides a magnificent view of the surrounding chimney pots. Along with attractive floral displays, the parks main attractions include; a crown bowling green, children's play equipment and five-a-side football facilities.